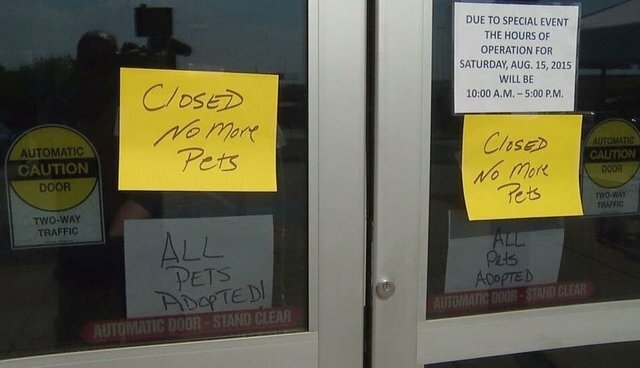 An animal shelter in Texas had no choice but to shutter its doors over the weekend, and for the best possible reason - they ran out of pets. On Saturday, thousands of needy dogs and cats found forever homes thanks to a nationwide adoption drive campaign called "Clear The Shelters," an annual event in which shelters waived their standard adoption fees. Hundreds of shelters throughout the country participated in the initiative, including Dallas Animal Services, where eager pet lovers turned out in droves to pick up their new furry best friends. In that one shelter alone, more than 200 dogs and cats were adopted in a single day! Although the pets were free to adopt, it was hardly a giveaway. Shelter volunteers emphasized the importance of proper pet ownership, ensuring that each adopted dog and cat wasn't paired with just any person - but rather their perfect person. "We had a lot of families who came out together, spent an hour or more waiting in line in the hot sun, then spent hours picking out the right pet, talked to the staff and volunteers, asked good questions, and then waited in yet another line to adopt," Dallas Animal Services wrote on Facebook. "They were great people." Afterward, the shelter shared photos showing a heartening sight: rows and rows of empty kennels that once held pets whose future was uncertain. Similar scenes were recorded elsewhere at the close of "Clear The Shelters" day; Eleven other shelters in North Texas reportedly adopted out all their pets as well - bringing a regional tally to more than 2,900 animals adopted. All the adopted pets were spayed or neutered, vaccinated and microchipped. Nationwide, more than 17,800 shelter animals were adopted by the end of the day, offering hope and love to creatures who need it most. Sadly, the shelters that participated in the event inevitably won't be empty for long. Every year, 7.6 million potential pets wind up in shelters in the United States, each one just as deserving of their own forever homes. Someone's ready to go home with you! #ClearTheShelters #ctsdfw Dallas Animal Services and Adoption Center To learn more about adopting a pet, visit your local Humane Society or ASPCA.